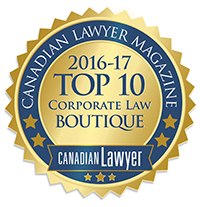 SkyLaw NewsSkyLaw Named One of Canada’s Top 10 Boutiques! SkyLaw is thrilled to announce that our firm has been selected as one of Canada’s Top 10 Corporate Law Boutiques by the award-winning Canadian Lawyer Magazine! It is an honour to be included among such an excellent group. For more info, see the full article on CanadianLawyerMag.com.